So, at least thematically, it looks and sounds a little like a certain, major franchise on a competing platform (something about “Gods” and “War,” if memory serves). But Ascend: New Gods is certainly its own beast, and it’s set to push XBLA and mobile phone cross-play in exciting new directions. 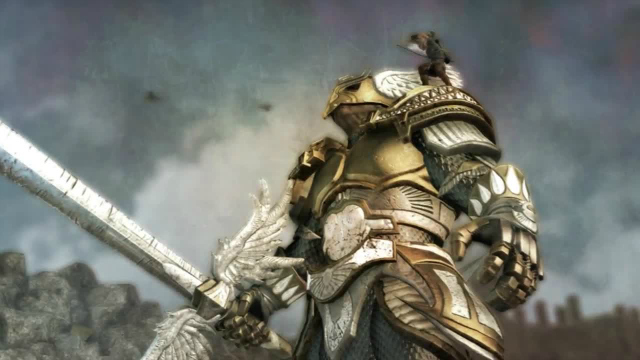 An action-RPG at its core, Ascend brings something its designers at Signal Studios are referring to as parallel multiplayer; while players engage in what is essentially a single-player scenario, they’ll also encounter other players going about their own games. They can interact with each other by sending “blessings” or “curses” to one another, which will help or hinder them accordingly. In effect, it can potentially be a cooperative or adversarial multiplayer game –- players just aren’t going to know which they’re going to get any given time they fire up Ascend: New Gods. More interesting, perhaps, is the asynchronous gameplay enabled by its Windows Phone 8 (WP8) integration. XBLA players can effectively enter the worlds of other players and engage in battle with their “Boss” characters. The defending player will then receive a push notification to their WP8 device, and they can participate in the battle by sending attacks with their phone, receiving feedback all the while. A release day has not been finalized, but Ascend: New Gods is currently pegged with an early 2013 release, so fingers crossed it’s not too far away. Iron Galaxy Studios has brought two exceptional ports to XBLA (Street Fighter 3: Third Strike Online Edition and Marvel vs Capcom Origins) and is now tackling a series that hasn’t seen the light of day since 2005: Darkstalkers. 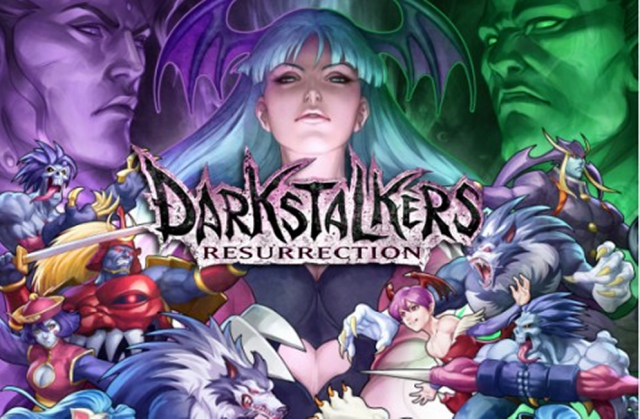 The aptly named Darkstalkers Resurrection brings not one but two games from the series to XBLA in one digital package. The original Darkstalkers was the evolution of Super Street Fighter II Turbo‘s having a greater emphasis on faster, combo-based gameplay relying on building a super meter and utilizing it for devastating combos or more powerful special moves (EX attacks). The eclectic supernatural and horror-inspired cast stood out from the rest of the fighters in the ’90s. It’s varied roster and the characters’ beautifully drawn and animated sprites remain memorable even now, nineteen years after the first installment. Night Warriors: Darkstalkers’ Revenge and Darkstalkers 3 will be the installments receiving the quality Iron Galaxy port treatment on XBLA. Online warriors will be pleased to see GGPO online support returning with lobbies supporting eight players and a tournament mode to boot. Arguably the coolest addition to the package is the ability to upload replays to YouTube, which I’m sure will never, ever be used to gloat. Tutorials are a big part of what made SF3: 3SOE a favorite of mine, and they’re thankfully making a return in Resurrection. They allowed me, a new player, to start with the basics and provided invaluable direction to the growth of my fighting game proficiency. Finally, packed away in the game’s vast Vault are bits of fan service including, but not limited to, new and old art that can be unlocked by performing challenges that will most likely ensure my frequent return. Sometimes, the best thing a game has going for it is a unique hook and a one-of-a-kind presentation. Such features are present in every aspect of Mediatonic’s upcoming Foul Play, a side-scrolling beat-em-up that takes a genre well-known to XBLA gamers and adds a polish and sense of humor that helps it stand out among the rest. In Foul Play you take control of legendary Victorian-era monster hunter Baron Dashforth. Now retired, the good baron looks back on a long and illustrious career and decides to document his adventures. However, instead of putting pen to paper and writing a book like most would, he decides to do something a little different — Dashforth decides to memorialize his travels by way of a colorful theater production, which is where the player comes in. Players, you see, won’t take control of Dashforth during his lifetime of demon killing, but as he recreates it for the stage. This aesthetic permeates every aspect of Foul Play — enemies are not monsters but extras and actors in costume; sets come and go as they would in a real stage production; and props and larger-than-thespian beasts are constructed from wood and rope. Additionally, players aren’t rewarded for brutal, vicious attacks as they might be in other brawlers. Instead, they see the biggest benefit from moves with a theatrical flourish. Down to its very core, Foul Play is about performing. It’s that unique sense of style and presentation — not to mention a cheeky sense of humor from the team whose previous offerings include Monsters (Probably) Stole My Princess and Adult Swim’s Amatuer Surgeon series — that will help Foul Play stand apart. XBLA has no shortage of side-scrolling beat-em-ups: Castle Crashers and Scott Pilgrim vs. the World for starters, not to mention numerous old-school classics like the entire Streets of Rage series. In a crowded market like that, a game needs a unique hook. If what I’ve seen to date is any indication, Foul Play‘s got that in spades. Harold, the first game to be released by Moon Spider Studios, represents a continuation of an important trend in this generation of gaming — the return of the 2D platformer, which was largely absent from the Xbox/PS2/GameCube generation. 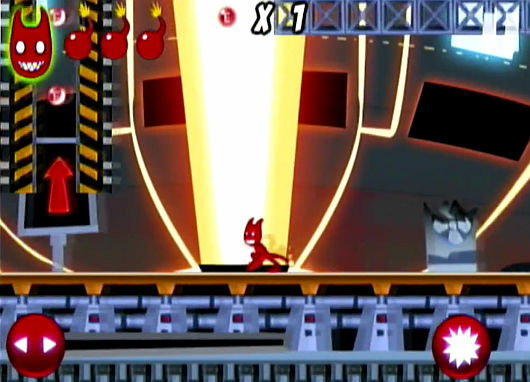 The side-scrolling platforming bounced back this generation and once again became an important genre along a variety of lines. 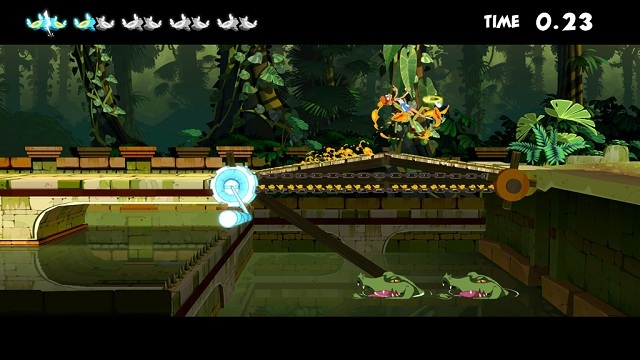 Rayman Origins is a return to form that stands alongside the best the genre has to offer. Shadow Complex, while introducing a few 3D elements, is a brilliant renaissance of the gameplay that made Castlevania: Symphony of the Night (PSOne) and Super Metroid (SNES) two of the best side-scrollers of their respective generations. Alongside this return of traditional 2D platforming have come games in which the developers manipulate player expectations of platforming conventions to marvelous results. Braid pulls the rug out from under players by focusing on the narrative conventions of the genre. Similarly, Limbo casts a stylistic net that recalls film noir and horror while keeping platforming conventions as the one thing familiar to players in an otherwise very strange (and scary) world. Harold continues this new tradition of modern platformers, recasting the gameplay in an unexpected way while maintaining the other conventions of the genre. 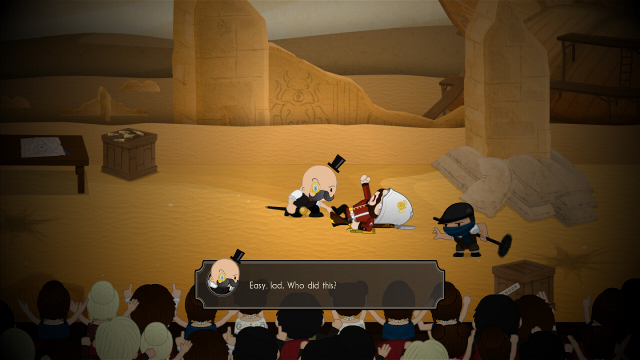 Players control an angel responsible for manipulating the environment in a way that allows Harold to continue moving forward, as opposed to controlling Harold himself. This gameplay has been tried a few times before — the action sequences of Ghost Trick (Nintendo DS, iOS) come to mind — but I believe that the concept has never been as fully refined as Harold‘s footage demonstrates. Harold is well positioned as part of this new tradition of convention-defying platformers to make a big splash on the XBLA scene when it releases later this year, and I can’t wait to see how it helps redefine my own expectations for platforming games moving forward. Developers like Twisted Pixel are rare. Since the studio’s 2009 debut on Xbox Live Arcade with The Maw, it has churned out absolute must-own games one by one from its own raw creativity. Twisted Pixel’s games not only replicate my fondest memories of gaming from the past; they make them dance. It’s hard to understand why Microsoft waited until their fifth winner, The Gunstringer (now the gold standard for Kinect games), to purchase Twisted Pixel, but LocoCycle should at least prove how much further they can go under Microsoft’s wing. If you haven’t yet seen the trailers, LocoCycle places you in the role of a sentient motorcycle assassin named I.R.I.S. who has bucked her rider, Pablo, and escaped from her manufacturer, Big Arms Incorporated. To retrieve its rogue assassin, Big Arms has sent the edgy S.P.I.K.E., another sentient motorcycle, who looks like he could work part-time for Ghost Rider. Their rivalry is brought to life with the voices of Lisa Foiles (Shiver) and Robert Patrick (Terminator 2: Judgment Day). LocoCycle revives the feeling of futuristic high-speed racers like Extreme-G and F-Zero that have gone walkabout for nearly a decade. Twisted Pixel isn’t really making a racing game, though; it’s making an action game. Despite dragging Pablo behind her like a ball and chain, I.R.I.S. can nimbly weave between cars and gun down her pursuers. When you get close enough, you can launch into the air to beat up flying soldiers with your own wheels, all the while juggling Pablo like a stuffed toy. 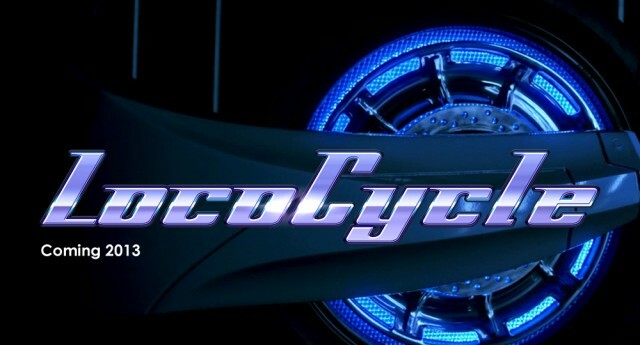 LocoCycle combines the thrill of speed with the grace of combat, charging you to drive hard and hit harder. Still no word on a release date yet, but considering Twisted Pixel’s history, there’s an excellent chance that LocoCycle will be featured in 2013’s Summer of Arcade. I remember the first time I played the original Bit.Trip Runner on PC. Before I even finished the first level I was captured by its catchy beats and simple gameplay. It seemed so simple: CommanderVideo runs automatically, so all I had to do was hit the right button to the beat of the music to keep him safe. But level after level, the game became increasingly difficult, slowly introducing new moves and obstacles. I became addicted to the game, and I still haven’t finished it to this day due to its unforgiving difficulty (or more likely my lack of rhythm). I’ve been dragged back to the start of a level more times than I can count. Simple to understand but difficult to master, I just could not get enough of this brilliant game. As you could imagine, when I heard one of my favorite PC games was getting a sequel I got super excited. 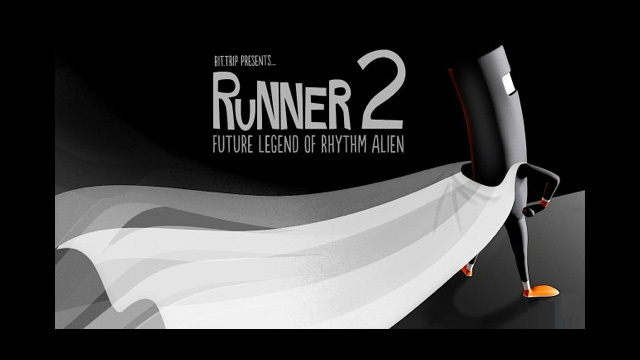 I always thought Bit.Trip Runner would be a great arcade game, and Bit.Trip Presents Runner2: Future Legend of Rhythm Alien looks like it will be a perfect fit on XBLA, even with its insanely long title. Runner2 is not merely a collection of new levels; its a full-blown new game. The graphics are fully overhauled, replacing the charming pixelated look of the original with brightly colored 3D worlds. The music has evolved from catchy bit tunes to beautifully orchestrated pieces. While still retaining its beat-driven platforming gameplay, Runner2 will introduce brand new moves and obstacles that will increase the variety and difficulty. The much-needed addition of checkpoints will alleviate much of the stress that missing a jump used to cause. Then there’s all the extra fixings that just make the game even cooler: brand new worlds, unlockable characters, costumes, rainbows and firing characters out of a cannon. After being delayed from last year, Runner2 is slated to release in Q1 of 2013, and it cannot get here soon enough. 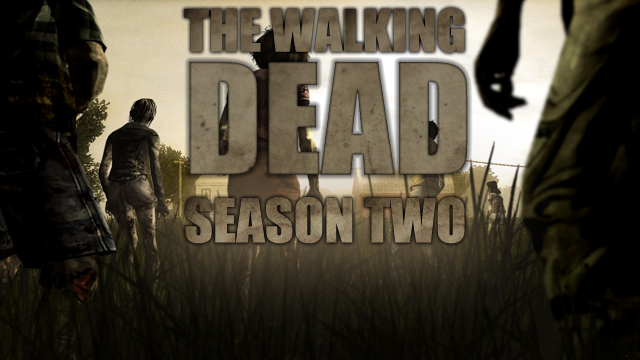 The Walking Dead: Season One was one of 2012’s most critically (and commercially) successful XBLA games, with each episode scoring 80% or more on Metacritic and 8.5 million episodes sold in total across all platforms. Whilst undoubtedly a worthwhile addition to the fictional world of The Walking Dead, the first five-part episodic game was certainly not without its flaws. 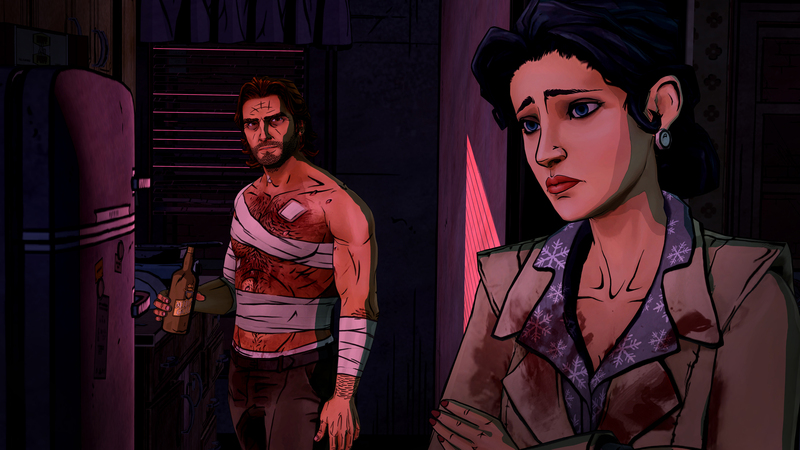 Personally, I noted the lack of player influence in several places and an overreliance on quick-time-event sequences as possible areas of improvement for Telltale Games to consider for the second season, which was announced some time ago in July 2012. Regardless of my opinion of The Walking Dead‘s technical competency, I was hooked by the engaging characters and intriguing plot within the first two minutes of loading up the game. It should come as no surprise to anyone else who has played the first season then that, for me, the most exciting thing about The Walking Dead: The Game: Season Two will be experiencing the next chapter in what must be one of the most compelling plots in videogame history. So far, Telltale has masterfully demonstrated the evolution of Clem’s character from that of a scared little girl into a true survivor. By the end of Season One Clem can shoot, forage for food and make decisions based on her own moral code. It’s this evolution that has me foaming at the mouth with excitement for the second season, because I just don’t know what’s going to happen — will players become Clem in the next game? Will she meet up with Omid and Christa? Will we meet a completely different set of characters? No matter which (if any) of those events play out, Season Two is my first must buy for 2013, because the show must go on and I am absolutely hooked. It’s tough to put your finger on the pulse of what makes State of Decay such an exciting proposition. With just a quick glance at the limited promotional footage, you could sum it up as simply as Grand Theft Auto meets Left 4 Dead, and superficially you’d be pretty close. The best of those worlds fused into a go-anywhere, do-anything, zombie-popping adventure. Beneath the surface, though, State of Decay promises so much more than a Frankensteinian sum of those parts. Its driving force is choice, the kind that manifests itself fluidly within every action you take and without your realization. No two survival stories can be exactly the same, as no two people are exactly the same. That’s something to get excited about. Perhaps it’s too easy to romanticize the potential of State of Decay given the many failed attempts in this industry to communicate a truly unique experience based on player agency. Though if anyone is capable of delivering, Undead Labs has certainly convinced me that that someone is them. Their devotion to player freedom, to simply providing the tools and the apocalypse, is what really makes this project special. So what is State of Decay? If we’re lucky it’s a mirror — a tool that can teach you a little more about yourself by stressing your weaknesses and weighing your strengths. 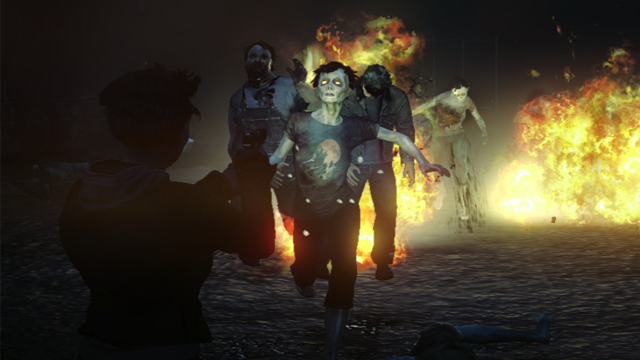 Fortunately, the end is nigh — State of Decay is on track for its “early 2013” release window. While the anticipation is certainly killing us…it won’t be long now. Over the weekend I received confirmation from the fine folks over at Penny-Arcade that I’d be getting a PAX East 2013 media pass. How is that at all relevant to picking Skulls of the Shogun as my most-anticipated XBLA game of 2013, you ask? Because it served as a reminder of how long I’ve been waiting for 17-Bit’s turn-based strategy game to release. At some point between March 11 and March 13 of 2011 I picked up a controller at PAX East and began playing a delightful little game that had theretofore been an unknown to me and was instantly captivated. Almost two years later that game still hasn’t released, but the long wait for it to do so is almost finished. Haunted Temple Studios, as Skulls developer 17-Bit was calling itself at the time, had brought with it to Boston in 2011 a strategy game with gameplay that was accessible and enjoyable enough to potentially appeal to a larger audience than most of its genre brethren. You don’t need to endure lengthy tutorials and memorize complex systems in order to start having fun with Skulls of the Shogun. Yes, the game does have tutorials, but they never feel intrusive to the experience of actually playing the damn game. Series like Advance Wars, from which 17-Bit drew much inspiration, have used dialogue between in-game characters to convey strategy game mechanics in the past, but 17-Bit has set the new standard here. The purposefully goofy banter between the game’s characters is partly responsible for the accomplishment, but that alone wouldn’t get Skulls of the Shogun too far without gameplay that’s instantly likable. Thankfully, 17-Bit has delivered on that front, too. Battles, at least in the early-going, are fast-paced and easy to jump into without ever feeling too easy. The removal of the grid layout that is so omnipresent in other turn-based strategy games and the addition of easily identifiable health bars (flags) above characters go a long way towards making 17-Bit’s effort fun for strategy newcomers. Meanwhile, its multiple unit types, consumable power-ups, light resource management and varied unit types should rope in those who are already fans of the genre. On top of all that, the game’s kaleidoscope of colors sure are pretty. 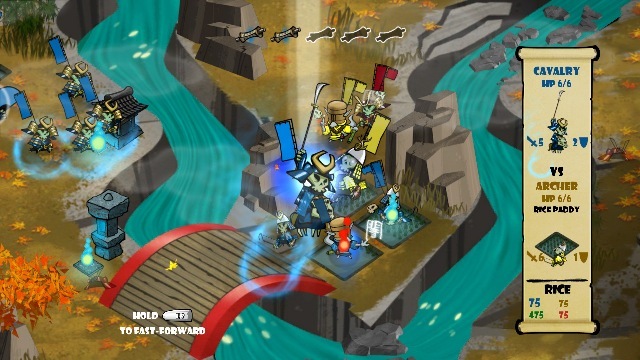 Skulls of the Shogun has suffered multiple delays since I first played it, but the game (thankfully) won’t be making its third appearance at PAX East this year: it will finally release next week on January 30, so no one will have to wait too much longer for my most-anticipated XBLA game of the year. Still want more XBLA titles to look forward to in 2013? Check out Part I of our most anticipated games of the year!